What did he look like? : A description of Godfrey of Bouillon: William of Tyre described Godfrey as "tall of stature, not extremely so, but still taller than the average man. He was strong beyond compare, with solidly-built limbs and a stalwart chest. His features were pleasing, his beard and hair of medium blond." The story and biography of Godfrey of Bouillon which contains interesting information, facts & the history about the life of this Medieval person of historical importance in the Crusades. 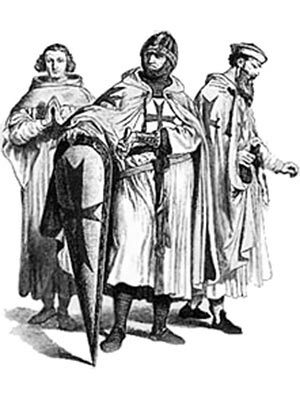 At the head of the Latin Kingdom of Jerusalem was placed Godfrey of Bouillon, the most valiant and devoted of the crusader knights of the Knights Templar order. Godfrey of Bouillon refused the title and vestments of royalty, declaring that he would never wear a crown of gold in the city where his Lord and Master had worn a crown of thorns. The only title Godfrey of Bouillon would accept was that of "Defender of the Holy Sepulchre." Many of the crusaders, considering their vows fulfilled, now set out on their return to their homes, some making their way back by sea and some by land. Godfrey of Bouillon, Tancred, and a few hundred other knights, were all that stayed behind to maintain the conquests that had been made, and to act as guardians of the holy places and the Kingdom of Jerusalem. Some interesting facts and short biography information about the History, Life & Times of Godfrey of Bouillon. Additional details, facts, history and information about the famous people of the Middle Ages and important events during their times can be accessed via the Middle Ages Sitemap.